With the variety of challenges present in every pipe burst restoration, its best to leave this kind of work to the professionals like Eli Elfasi and Daniel Gradus, along with their IICRC certified water damage Cortlandt Manor team with 911 Restoration Westchester. Eli and Daniel are aware of all these different challenges and the best ways to resolve them as well. This is why they make sure to arrive within 45 minutes of any emergency call for help with water damage restoration. “Our teams are available 24/7/365 to be anywhere we need to be with all of the latest drying and suction equipment and technology at hand to save the day,” Daniel says. This high level of expertise that Daniel and Eli bring to every job comes only from total professionalism and dedication to giving people back their homes quickly and in the condition that they have come to love and enjoy every day. “Beyond our ability to get to the scene quickly and with all the most talented experts in the industry, we also know how difficult these times can be for people and that’s why we make sure to walk our customers through every aspect of any job we take on,” Eli says. If your home is currently flooded from a pipe burst, water heater malfunction or any other form of flooding, then you need to contact Daniel and Eli, along with their water damage Cortlandt Manor team with 911 Restoration Westchester for help today! Daniel and Eli are absolute experts in the water damage restoration industry and this is why they have become the go-to resource for people in the Cortlandt Manor area who have such challenges at hand. By being the most trusted resource around, Daniel and Eli also get a profound number of calls requesting help for preventing such situations all together. “We field calls all the time helping people to keep their homes safe and dry from water damage and that’s why we have developed a long list of simple maintenance tasks that people can do to stay safe,” Eli explains. Make sure to keep your home above the freezing point when winter hits to avoid pipe burst situations. Before the snow starts, make sure to clean out the gutters and downspouts so that there is no debris which may cause an overflow or ice dam to form and create ceiling leaks. At the discharge point for your downspout, make sure it is pointing away from the home by at least five feet to stave off the possibility of liquefaction in the foundation. Have a professional inspect the flow and capacity of your system with a snake scope at least once every few years to make sure small challenges are caught before they grow larger. 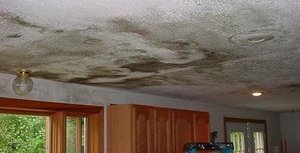 “We have a huge list of things that homeowners can do to keep their homes safe from the effects of water damage no matter what form it comes in,” Eli says. If you are having a water damage related concern take place in your home or business and you need to remediated by the best there is, then don’t hesitate to contact Eli, Daniel and the water damage Cortlandt Manor professionals with 911 Restoration Westchester today! 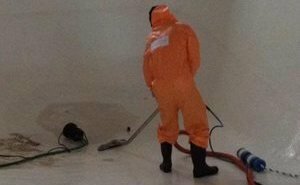 Eli and Daniel have been providing solutions to the challenges of water damage situations for long enough to have seen everything that there is to experience in this business, and that level of heightened expertise makes them the trusted service provider for Cortlandt Manor or anywhere else around for that matter. “One of our most recent jobs was for a homeowner who was trying to replace their water heater and as they extracted it, the rusted pipe broke loose and spilled the entire heaters worth of rusty water onto the ground,” Eli explains. After Eli and Daniel took care of all the rusty category two water left over from the heater they then started to extract all of the drywall that was affected from the situation. Making the home like new again is what Eli and Daniel do every day, and part of this process is to help the homeowner out with all of the insurance paperwork that is required in these situations. If your home is being affected by the damages from a water heater failure, then don’t wait another minute to contact Daniel, Eli and the water damage Cortlandt Manor team with 911 Restoration Westchester today!